The following group types are not accepted by this hostel: Junior / Primary School, Sports Group If you have misrepresented the type of group you are booking for, your booking may be cancelled by the hostel." Only one minute from the main square, the 3 suites provide absolute privacy, the gorgeous mixed dorm encourages adventure sharing. All can enjoy the warm, communal atmosphere of the courtyard, Moroccan salon-dining room, and 2 flower and fruit tree draped roof terraces. All this enhanced by your own personal soundtrack with iPod speakers in each room, and free wifi access throughout the hostel. You cannot help but find your favorite colour here by day Layla Rouge is a vase of flowers or a box of hand decorated chocolates, or an techni-flavour ice-cream stand; by night a treasure chest of glittering jewels, or a sparkling solar system. Use your imagination. 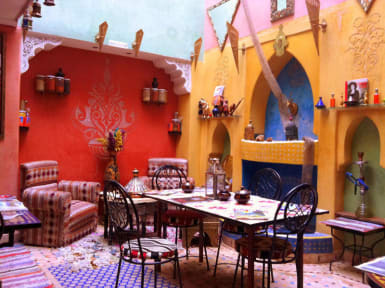 Riad Layla Rouge wants you to get comfy in Marrakech; to feel safe and happy; imaginative and inspired we combine a hostel spirit and atmosphere with that little bit of indulgence that you find in a luxury riad. Share your stories of travel and life. Laugh over tea and cake with other guests in our (almost) edible house. Beau Riad juste à côté de la grande place, et des bus. Personnel ultra accueillant, et attentionné. Rien à redire ..
Had an awesome time at this hostel. Great vibes, met some great travellers and had an awesome time with our host Ismael! Rooms are really nice and neat, great terrasse on the roof and the breakfest was really good. I highly recommend!! Bien situé a quelques minutes seulement de la place jemma el Fna. Facile a trouver grâce aux indications. Le personnel est sympathique. L établissement est propre. Mon séjour fut très agréable. Awesome place, the 2 staff Ismael and Mohammed are super friendly guys. Good atmosphere and chill vibes :). J’ai passé une super nuit au Riad Layla Rouge. Le staff est super, accueillant, aidant, vraiment sympa . On se sent comme à la maison , mais en mieux! :) la terrasse est magnifique avec vue sur les toits de Marrakech. Je recommande! Jolie Riad à deux pas de la fameuse place de Marrakech. Le personnel est très gentil et accueillant. Très bon week-end à Layla Rouge, très bien situé, au cœur de la médina. Merci à Ismaël pour son accueil et l’attention qu’il accorde au bien-être des clients du Riad. Bon accueil avec thé, staff sympathique qui aime échanger, super emplacement, chambre privative propre (seul bémol: wc et douche sans porte!!) et espaces communs cool avec terrasse agréable! Je recommande!